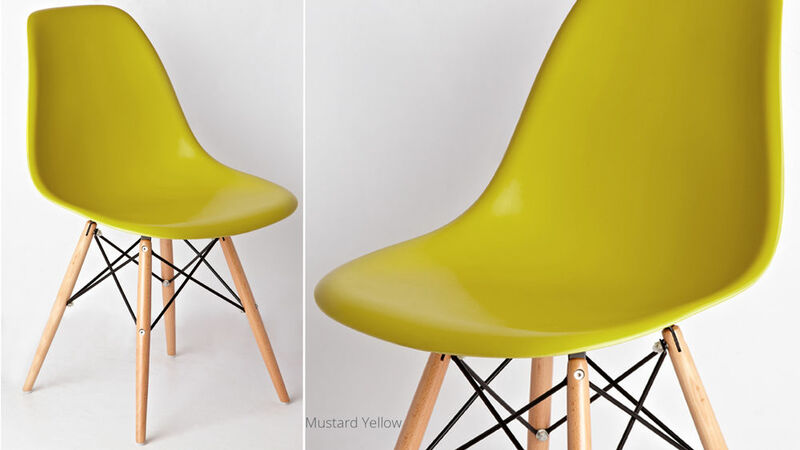 For our Eames Style Dining Chairs, we've taken an iconic design and given it new life with our mid-century modern inspired palette of colours. 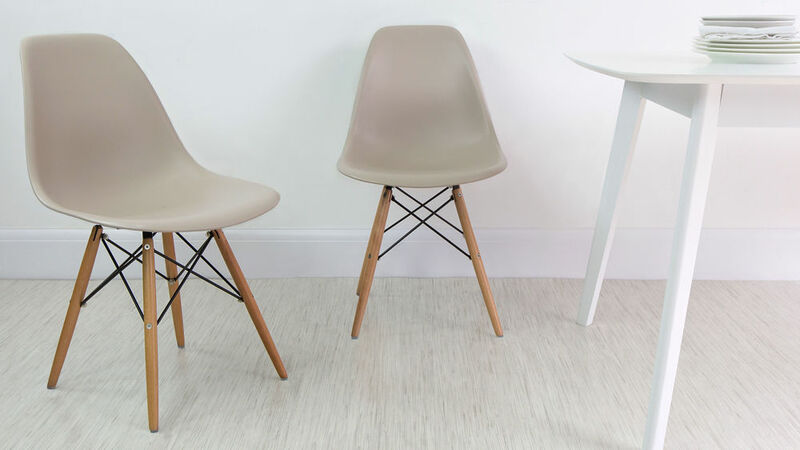 By selecting a range of subtle muted tones and positive accent colours, our Eames chairs beautifully blend together, complementing almost any interior scheme. 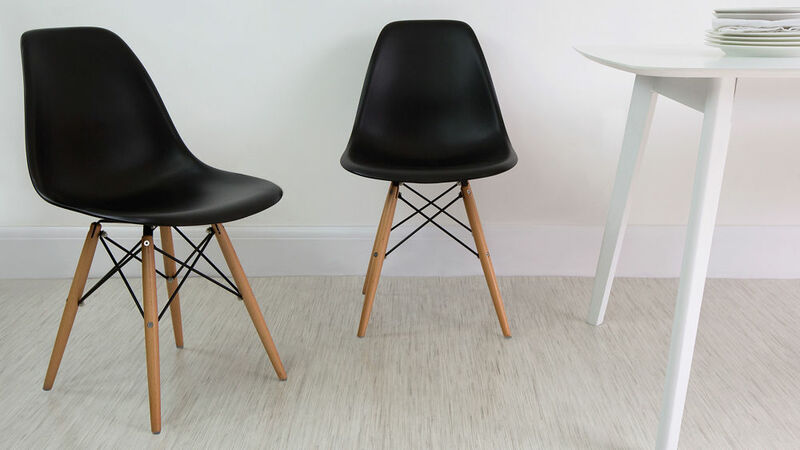 Eames chairs are a great choice for the style-conscious as they are a simple yet effective way to add a piece of stylish flair to an interior. 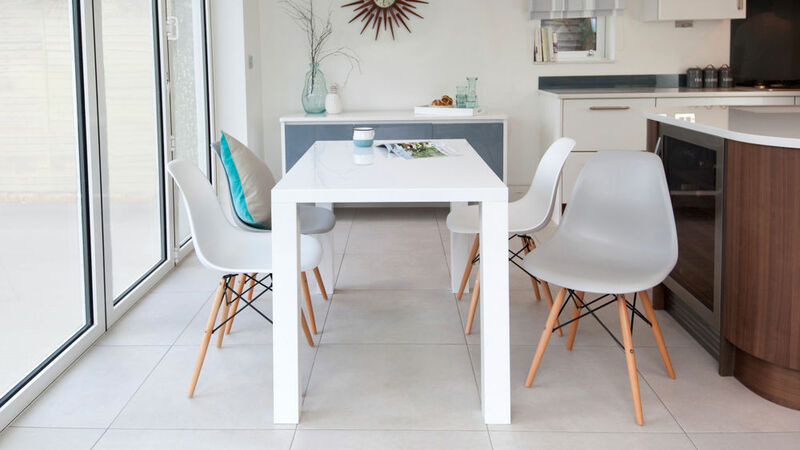 Just picture these gorgeous seats in your own dining area- the choice of colours is up to you! This lightweight hard wearing chair is perfect for modern living. 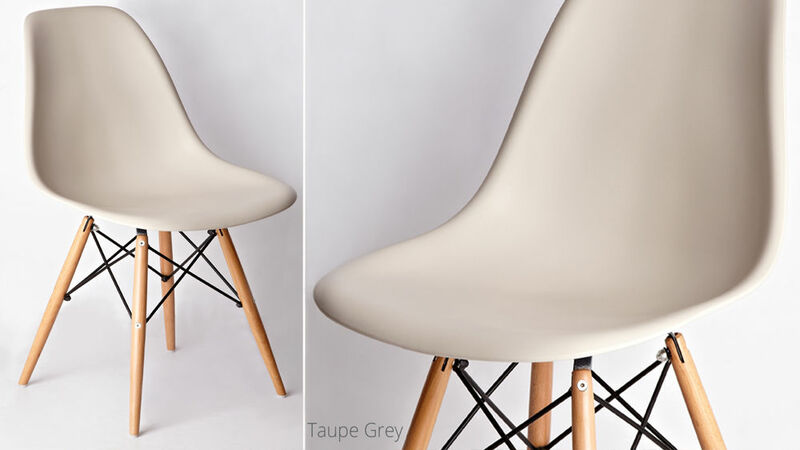  The seat is made from Polypropylene, which has a durable, wipe clean finish. 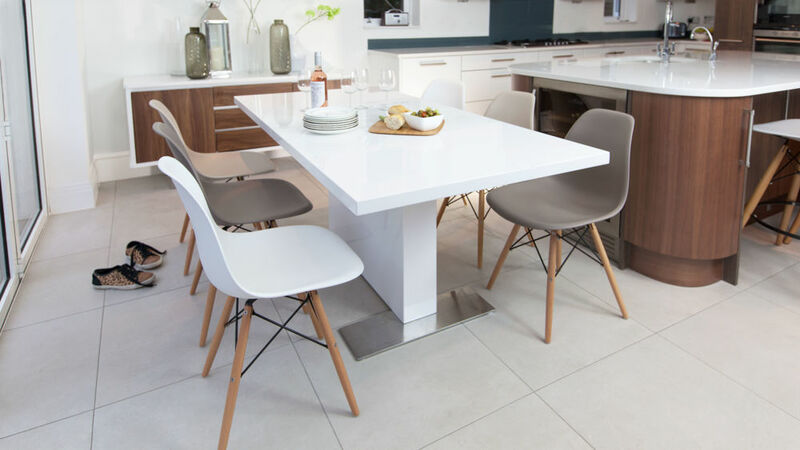 The seat has a light texture that won't show grubby fingerprints making them ideal for family meal times. 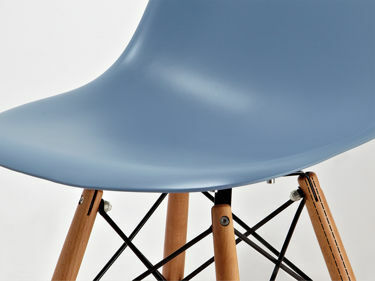 The ergonomically designed seat shape of the Eames allows you to easily and safely place a child booster seat. 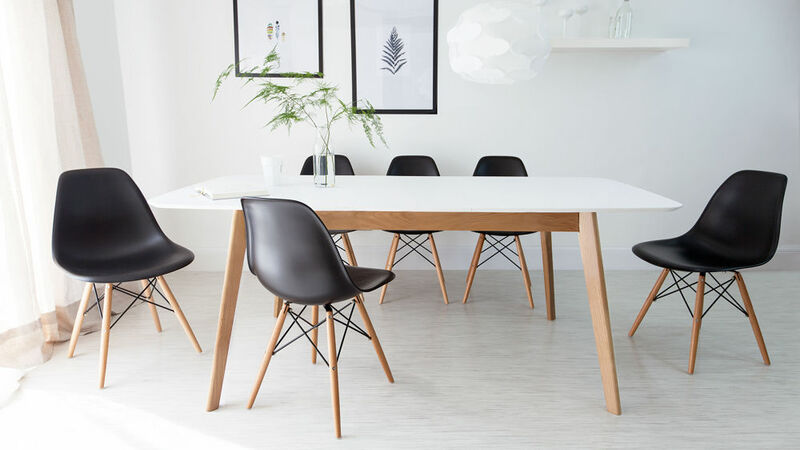 This again makes the Eames incredibly well suited to family dining. 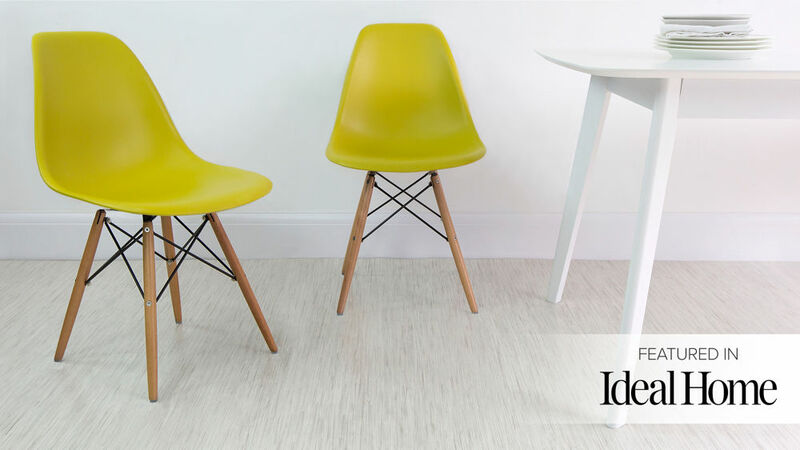 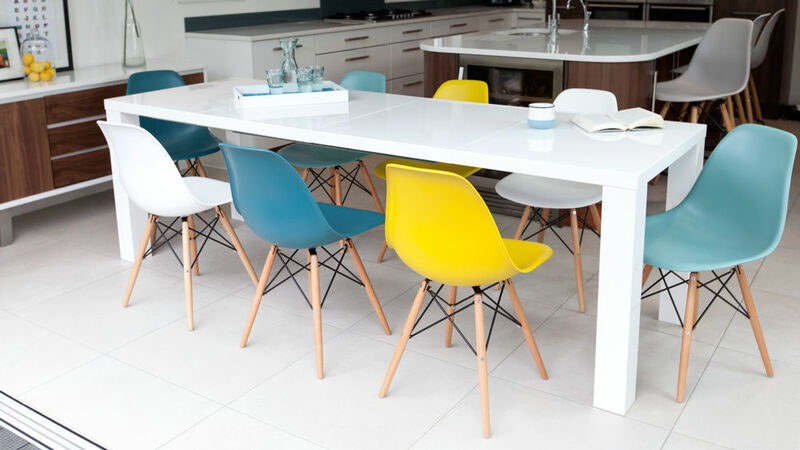 Our Eames chairs have a fun and bold look due to a colour palette we curated with real homes in mind. 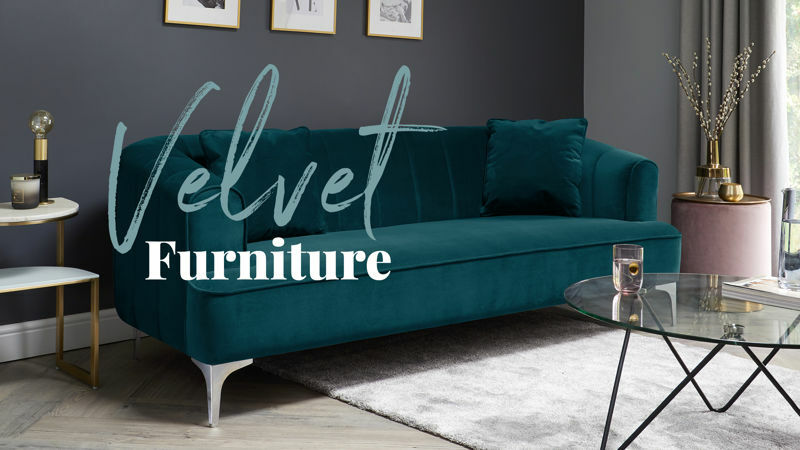 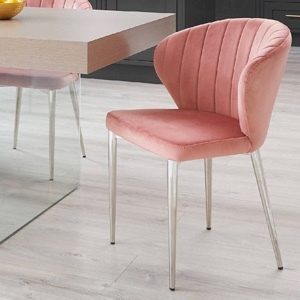 We've made it easy to add a pop of colour or mix and match these chairs so you are sure to find a combination that suits your own personal style. 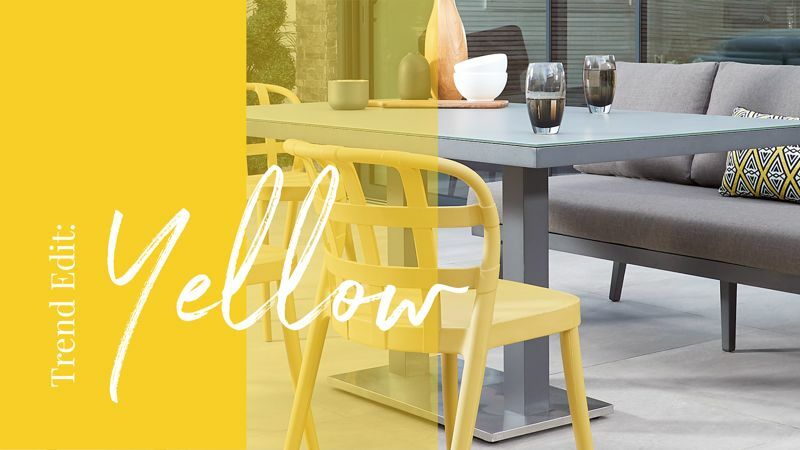 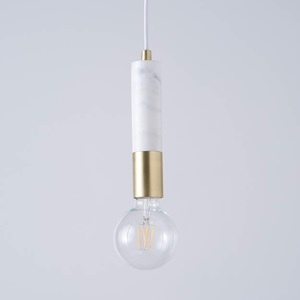 This makes coordinating to your existing interior even easier as there is a colour to suit almost every home and colour scheme. 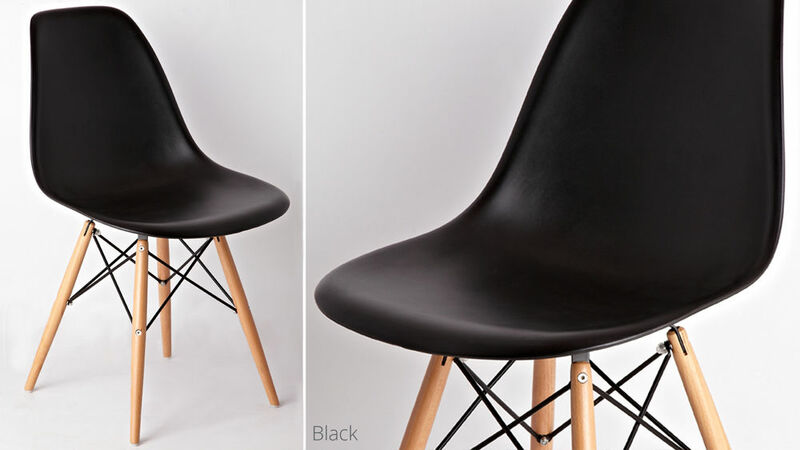 We've added rubber washers between the fixings, ensuring that the hard parts don't squeak or become loose over time. 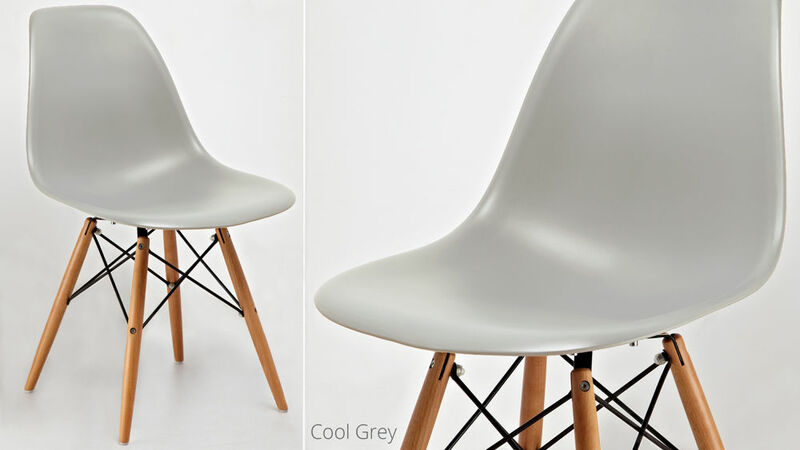 This clever feature is something that you won't find on many other Eames chairs on the market. 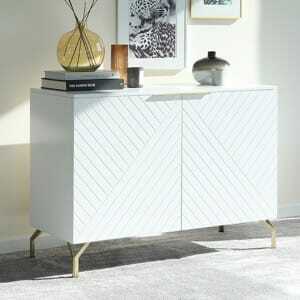 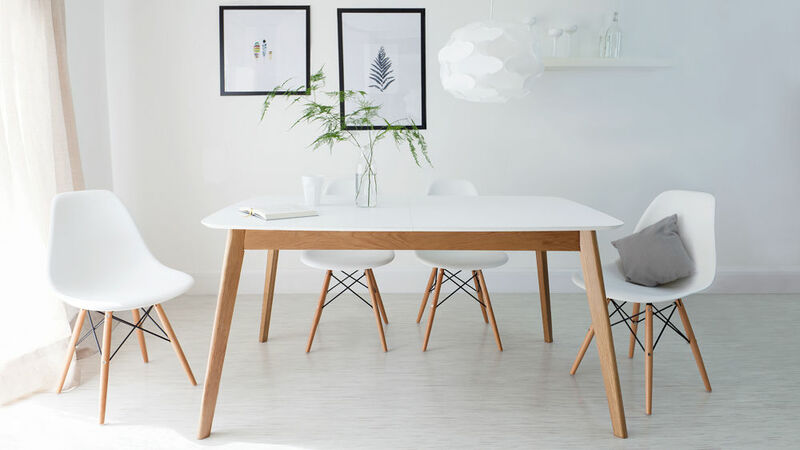 The solid beech legs are enforced with an internal steel support. 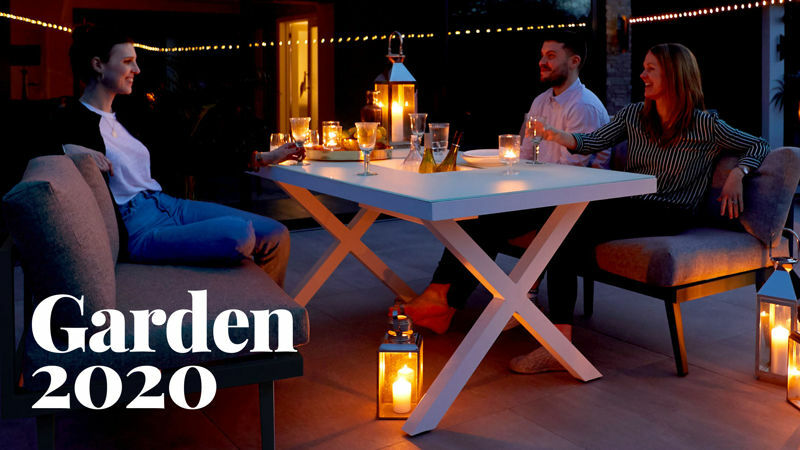 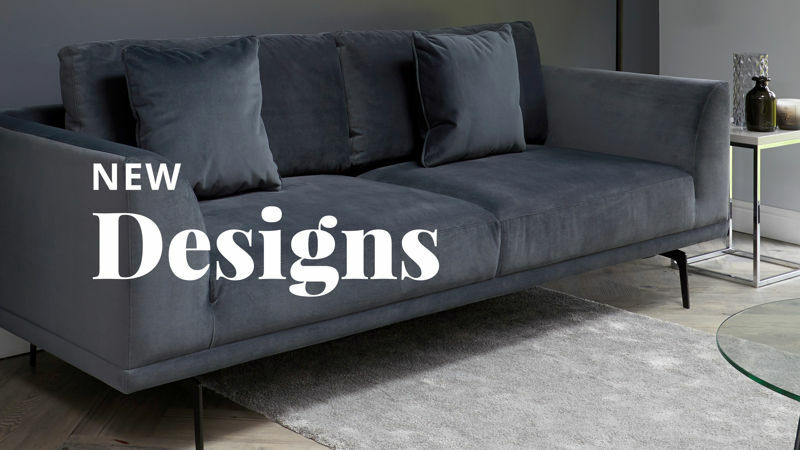 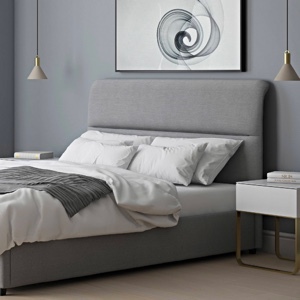 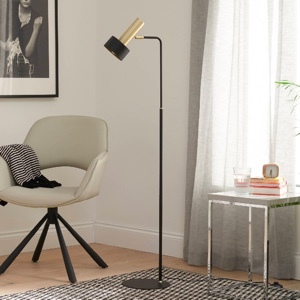 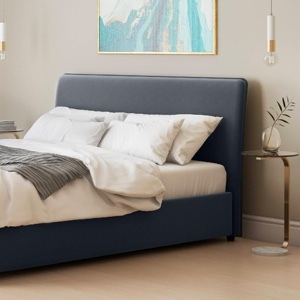 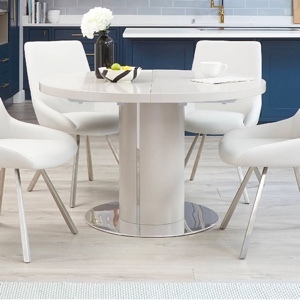 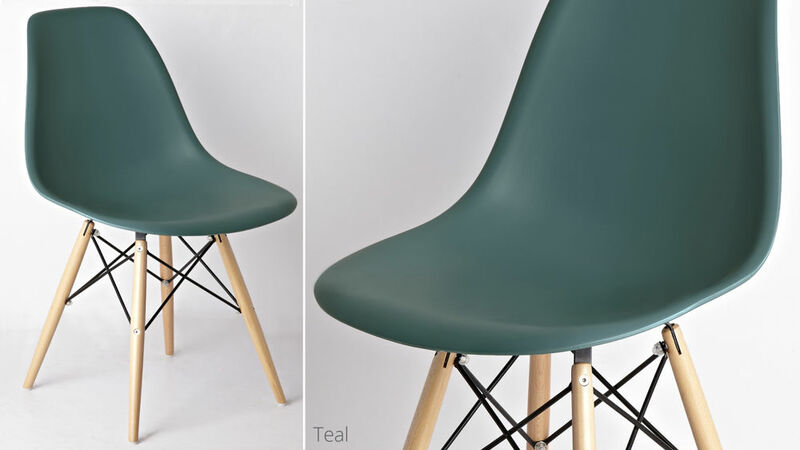 This secret support, plus the steel cross wires on the base, results in the chairs not only being hardwearing and sturdy but also still maintaining a sleek streamlined look. 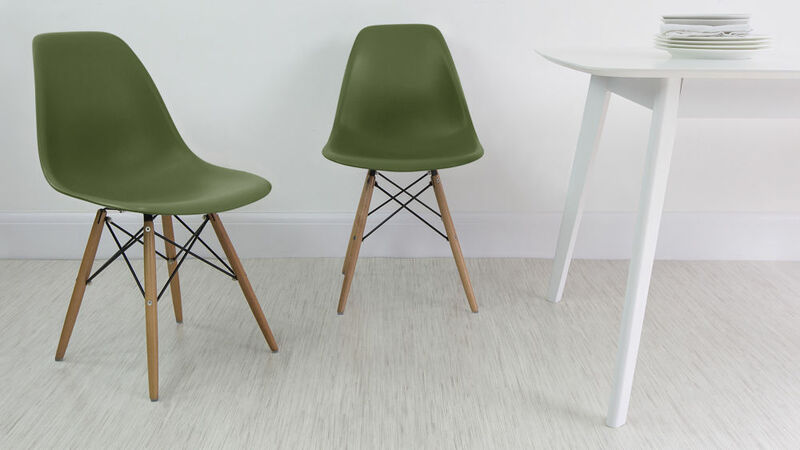 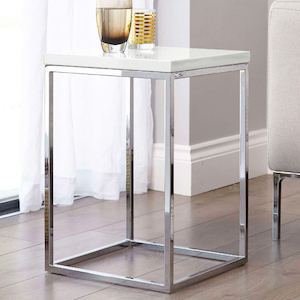 Clear floor protectors are used on the base of the legs which will protect your floor, minimise drag noise and protect the solid beech chair legs. 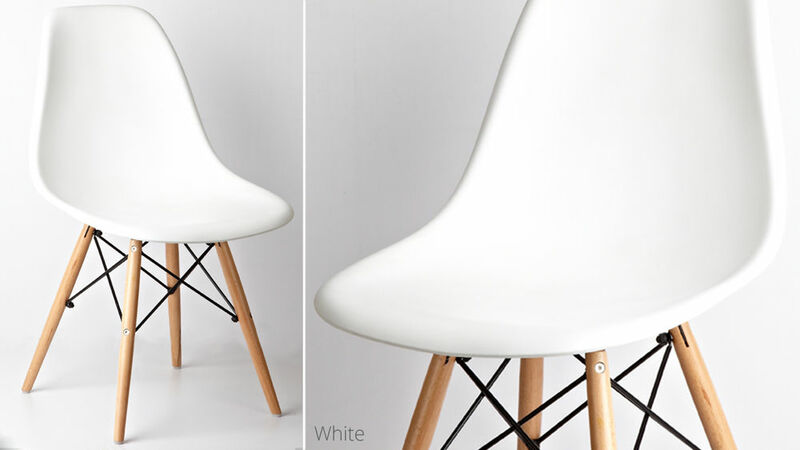 Please be aware that the seat height on these chairs is 43cm from the floor, This is lower than a standard seat height. 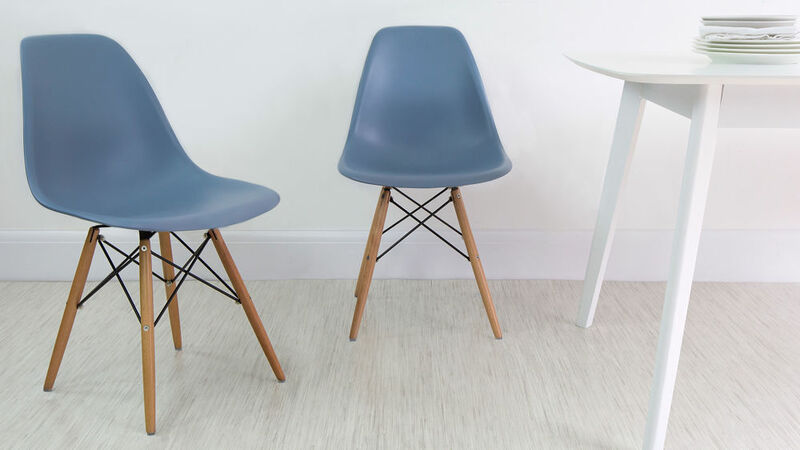 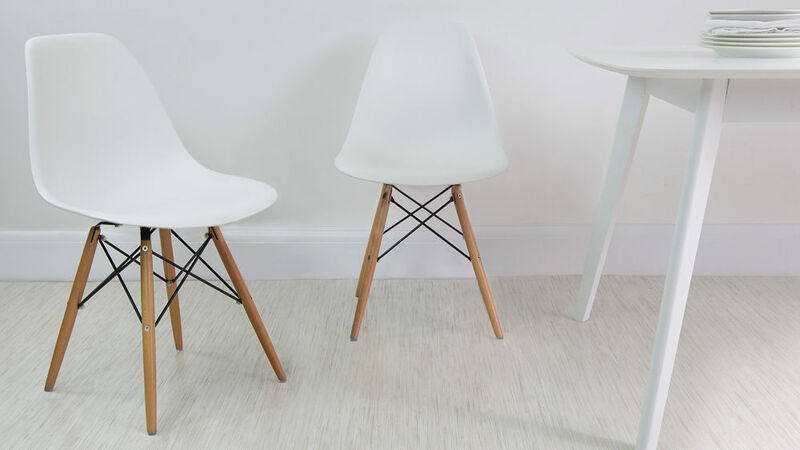 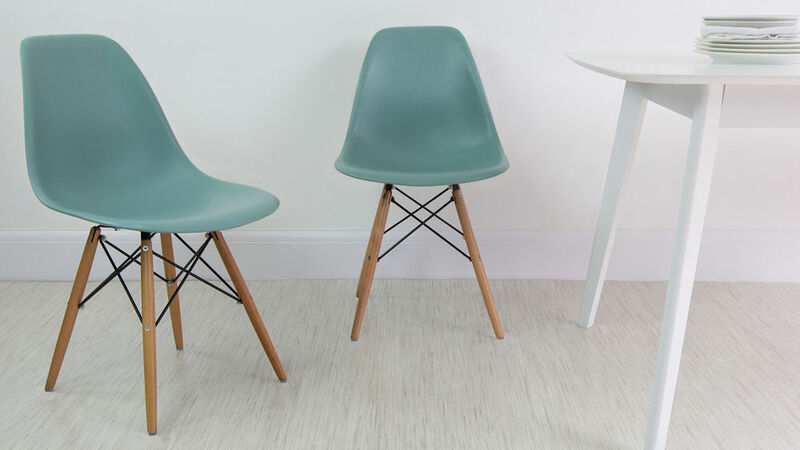 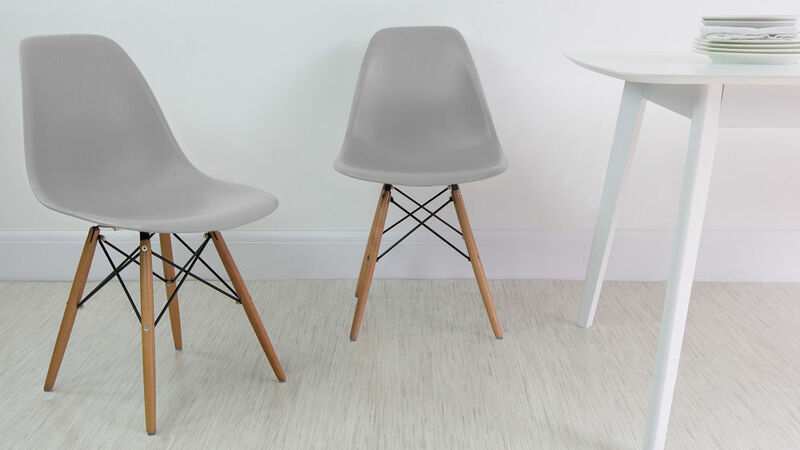 We have designed our Eames chairs with practicality in mind, making them rank much higher than many other versions available based on support, durability and price. 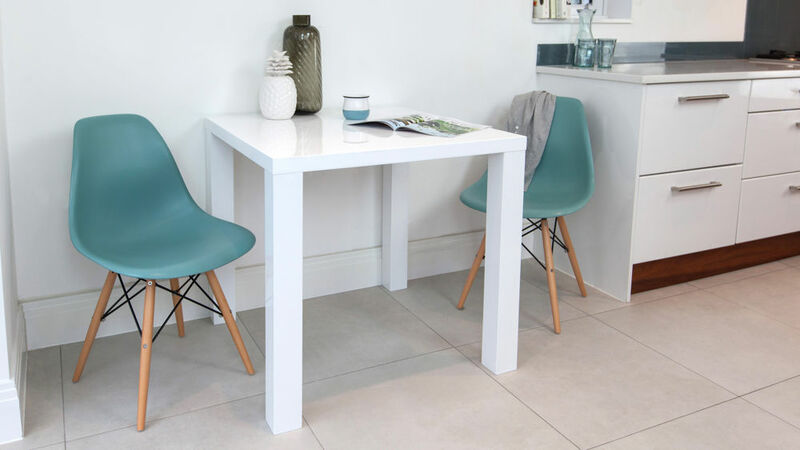 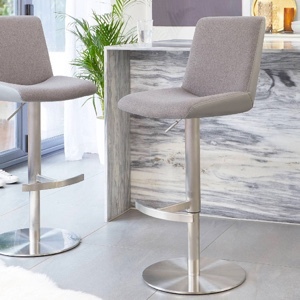 If you like the Eames style, why not take a look at our Eames Style Bar Stools to create a coordinated look in your kitchen or dining area. 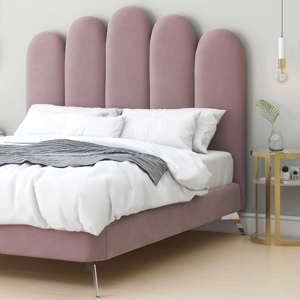 After something a bit different? 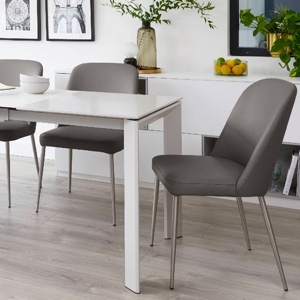 Try our Eames Moulded Wire Frame Dining Chair, which has the same seat shape and design, but with a modern wire frame base. You will find these chairs available elsewhere but don't be fooled by the look. 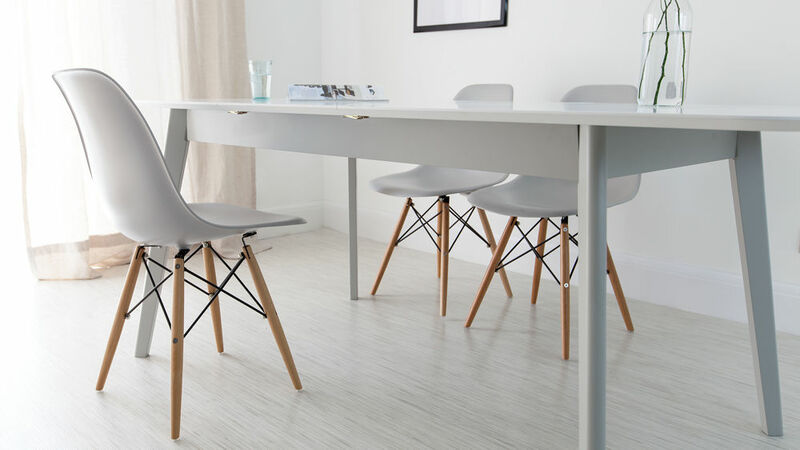 With our chairs, it's the details that you can't see that are adding the value, making these chairs stronger, better performing and more durable than many others on the market. 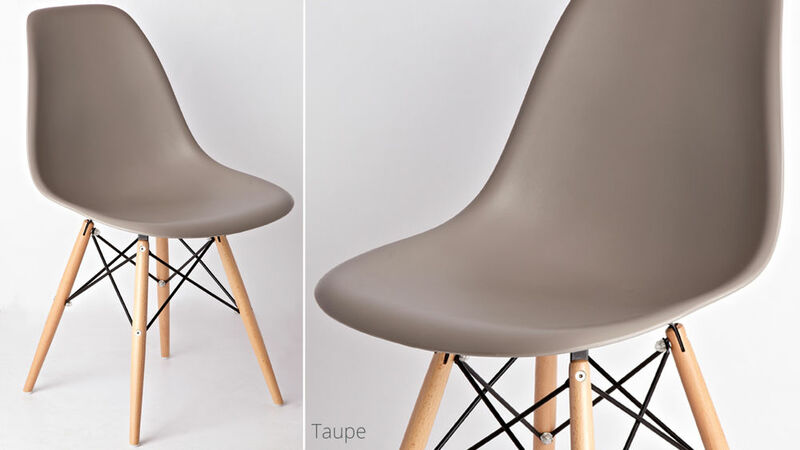 We have worked with our manufacturers to custom engineer the internal structure of the chair. 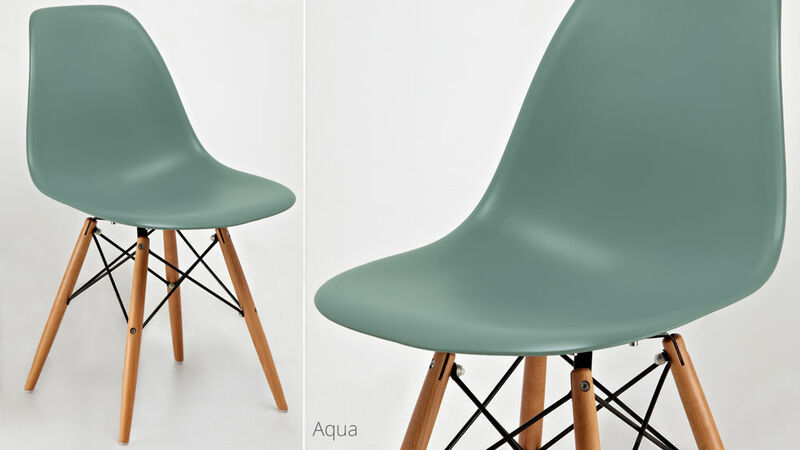 Ours really are better than the rest. 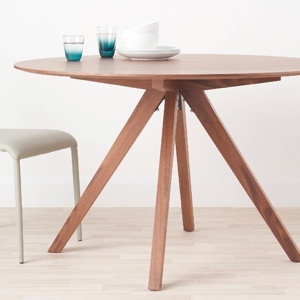 The beech legs have a steel rod on the inside, running the length of the leg. 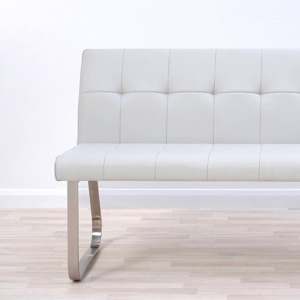 This adds great additional strength and stability but doesn't compromise on the look. Semi opaque floor protectors neatly finish the edge of chair leg. 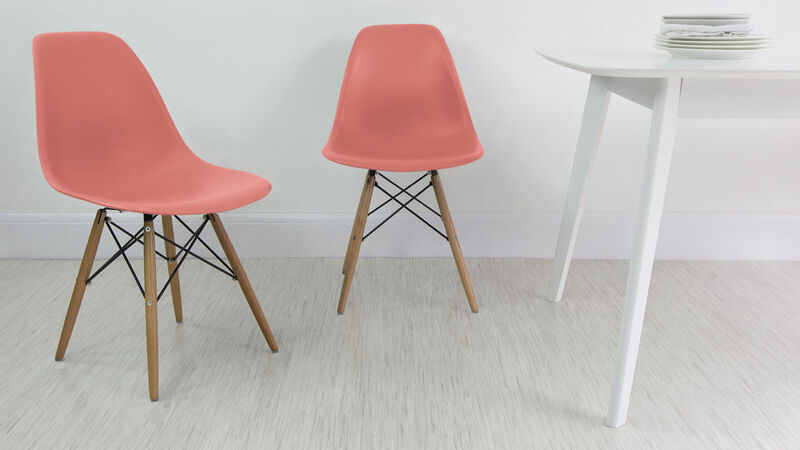 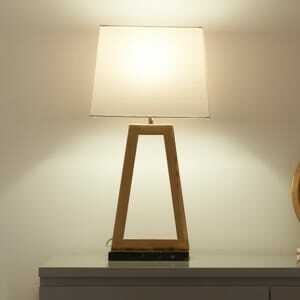 You can barely see them but they protect your floor, protect the finish on the chair leg and keep noise to a minimum.